A fabulous new book is out this week, and I can’t stop talking about it. It’s innovative, fun, perfect for lovers of history, literature, and illustrated novels. Here’s the gist: author Caroline Preston has put together a “scrapbook novel” with text set against full-color pages of historical ephemera, both of which combine to tell the story of Frankie Pratt, a smart young woman who graduates high school in 1920 and goes on to college, Paris, and the writing life. It’s such a fresh idea, and each page is vivid and welcoming. You dive right into Frankie’s story, told in typewritten snippets, and page through reading both the text and the images. The tone is smart and sassy. It’s like reading an entire book of Anne Taintor. Preston, who has written three previous novels, is also a former archivist at the Peabody/Essex Museum and Harvard's Houghton Library. She collected more than six hundred pieces of original 1920s ephemera to create this book, and she brings a real love of history to each page with reproductions of a Vassar yearbook, a third-class menu from the Mauretania, a 1924 Paris Blue Guide, a dust jacket for The Sun Also Rises, and so much more. Each page is a delight. On her website, Preston reveals her collecting tendencies. She writes, "My mother could be called a tidy pack rat--keeping many generations worth of diaries, letters, clippings, dresses and weird souvenirs in neatly labeled trunks and boxes." One of her favorite discoveries in the attic? A few pages of Ulysses corrected by Joyce himself, sent to Preston's grandmother by a friend who happened to be Sylvia Beach! To read more about the story behind this clever new book and watch the book trailer, go here. Preston also begins a media tour this week. Take a look at the schedule, and go get your book signed. 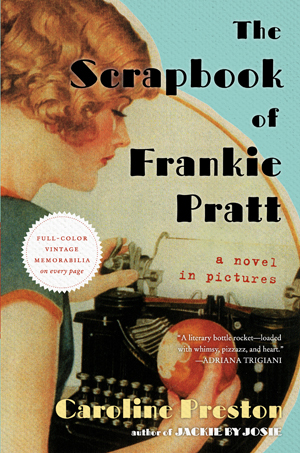 The Scrapbook of Frankie Pratt is an exciting novel in form and content, and that doesn't happen too often. Don't miss it. A fabulous new book is out this week, and I can't stop talking about it. It's innovative, fun, perfect for lovers of history, literature, and illustrated novels. Here's the gist: author Caroline Preston has put together a "scrapbook novel" with text set against full-color pages of historical ephemera, both of which combine to tell the story of Frankie Pratt, a smart young woman who graduates high school in 1920 and goes on to college, Paris, and the writing life. It's such a fresh idea, and each page is vivid and welcoming. You dive right into Frankie's story, told in typewritten snippets, and page through reading both the text and the images. The tone is smart and sassy. It's like reading an entire book of Anne Taintor.